Bloomfield West Street Paving – French-Reneker-Associates, Inc. 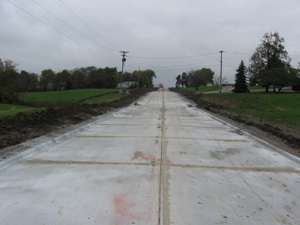 This project included removal and replacement of 25 blocks of West Street in Bloomfield, Iowa. The majority of the project was a 25-foot wide curb and gutter, urban pavement. The north two blocks was a rural cross section, with the west half being outside the city limits. The city and the county cooperated on payment for the portion of the project that was partially outside the city limits. The project was split into two construction projects. The first construction project was to relocate and repair existing utilities. The second project included the grading, storm sewer, granular subbase, subdrains, paving, driveways, sidewalks, and finish work. French-Reneker-Associates provided the preliminary cost estimates, field survey, final design, engineering during construction, and construction observation for both construction contracts. Alternate bids were taken for the paving to increase competition. The alternates included 9 inches of hot mix asphalt (HMA) versus 7 inches of portland cement concrete (PCC). The low bid was PCC and was about 5% less than the bid for the HMA. This project received the 2010 award from the Iowa Concrete Paving Association for municipal streets less than 30,000 square yards.